I didn't drop off the face of the earth. 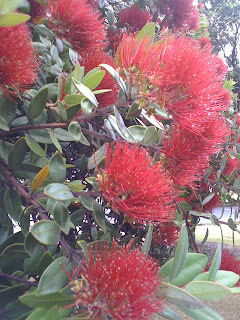 I went to New Zealand. Wellington is about as rainy as Oregon (more so, some days) but the sun peeked out and I didn't catch the fabled wind. 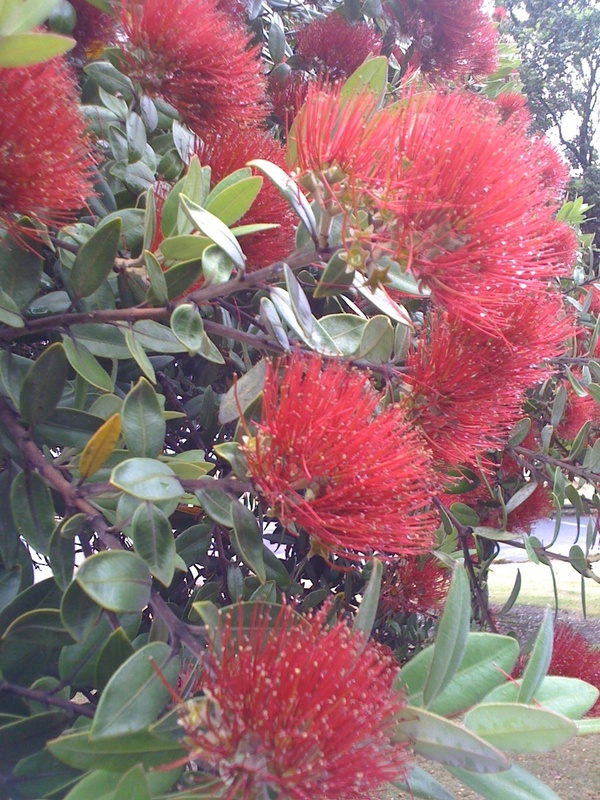 The Pohutukawa trees were in bloom, many of them. I left the hotel window cracked (the room was stuffy) and woke to birdsong around 5 a.m. Then came the truck. I had a seventh floor room overlooking the city, with a slice of harbor in the distance. The botanical gardens held plump, busy brown parrots. A sign above the entrance to the hotel gym, located just off the pool, pleaded No wet costumes in gymnasium, please. Of course, I knew what they meant. But I prefer to imagine soggy pandas, witches, superheroes--all the stuff of Halloween--dripping on the free weights and the nonskid floor. My first stop was a translation conference-- "Talking Past Each Other" -- held at the New Zealand Centre for Literary Translation (Victoria University of Wellington). It was a terrific conference, with strong papers and good conversation (and tasty snacks!). Big cheers for Jean Anderson, the center director, and her team. I have another long list of books to seek out. 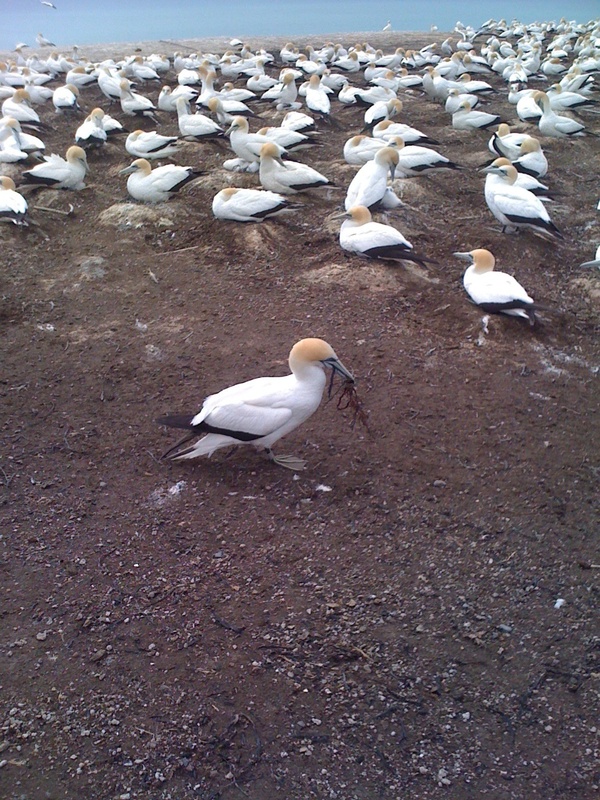 One highlight: a tractor-pulled excursion along the beach to the gannet colony at Cape Kidnappers. I don't know how many birds there were--thousands--burbling and hooting, dragging seaweed back to the line the nests, preening, stretching, edging restlessly around the fluffy, awkward chick in the nest. They don't hatch all at once, so there were gray, nearly featherless chicks the color of stone next door to bewildered white powder puffs, stretching their necks to look around. The chicks spend four months or so just sitting in the nest; those that roll or stumble out are likely to be pecked and harassed to death by territorial neighbors. At roughly four months of age, the chicks make their first flight--to Australia. Many swim part of the way. The tractor trip is evidently a traditional family outing for many in the area. Most of the group of 20 or so of us were Kiwis, some local, some from a few hours away. A couple from Christchurch were making their third attempt at seeing the colony with chicks. There were two German families, and families from Singapore and Malaysia. I was reading Ursula K. Le Guin's The Left Hand of Darkness at the time, a book (for those who haven't read it) in which gender is distinctly undecidable. 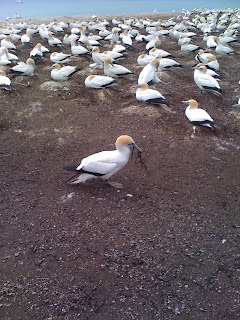 So I was struck by the guide's telling us, first, that male and female gannets are indistinguishable: same markings, same size, both sit on the eggs. But, he went on, it's the male who gathers the seaweed for the nest. If we saw one with a beak full of greenery, we'd know what we were seeing. Traveling, you want to know what you're looking at. And if we have the categories, it's hard not to use them.